The class of Amphibians developed around 400 million years ago, in the Paleozoic Era. They developed from fish and were probably the first animals to walk on land. Water, however, is still essential for them today: as the term “Amphibian” indicates, they spend one part of their lives (mostly the juvenile stage) in water and another on land. Amphibians not only breathe through lungs, but also have thin skins that assist oxygen conversion. All amphibians are carnivores. They seem defenceless at first, but many species developed toxin production in the skin that make them less tasty for predators (the most famous example being the Poison Dart Frog). Amphibians are usually found in or around moist places (near streams, puddles or in wet forests). The best time are wet nights, particularly during rainy season. As there has been a significant decline in amphibian populations all over the world, a scientific controversy has begun. No clear reasons have been found yet, but it is assumed that amphibians might be indicators of environmental health (like canaries in a coal mine). This might announce ecological transformations that will affect other species later. Another hint points to a disease, spread by an African toad. However, Panama has already lost a huge number of its frog population and almost a third of the worldwide frog population is vanishing. The golden toad of Monteverde is Costa Rica's first one to be extinct. Let's hope that something can be done against this development before it is too late. Most frog families live in semi-tropical or tropical zones, but the “true frogs” (ranidae) are found in temperate regions and Africa. Frogs are actually spread all over the world except Antarctica. Rainfrogs are usually of a cryptic (inconspicuous) colouring. They can be found on low and middle elevations and mostly live in forests. Rainfrogs have distinctively large finger disks that serve as suction cups. 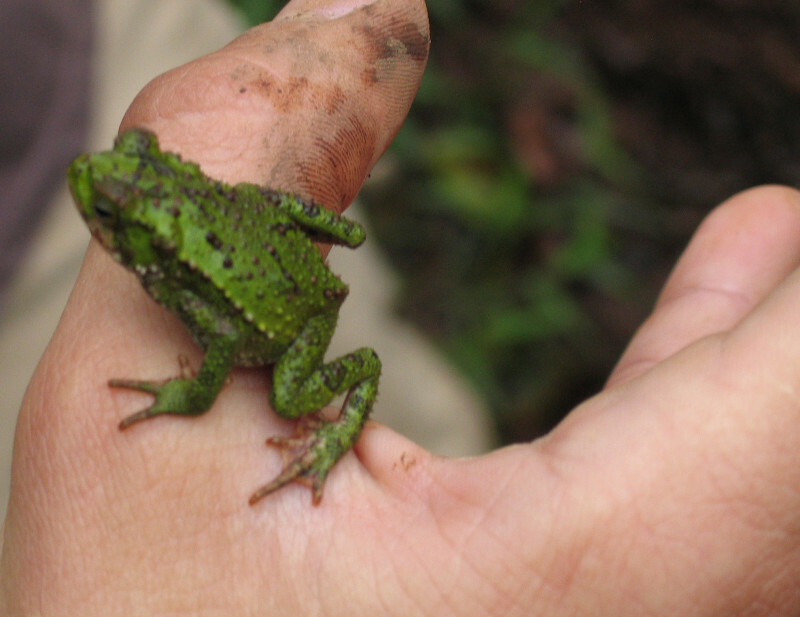 Most Costa Rican rainfrogs are tiny (2-3 cm), but some species, such as the Smoky Jungle Frog can range up to 15 cm. This latter frog is able to discharge a potent poison called leptodactylin: it messes with the nervous system and blocks neuromuscular activity. But it has to enter the body through mucous membranes (mouth nose, etc. ), so mere touching the frogs is not dangerous (unless you have any open wounds). Breeding behaviour can be quite different: some lay eggs in moist places on land, others put them in foam nests near water. An interesting behaviour is the deposition of eggs in water pools of bromeliad plants, which are attached to trees. Being arboreal creatures, most females lay their eggs in small water pools of plants growing on trees (mostly bromeliads). The eggs quickly develop into tadpoles and after a few weeks become froglets. 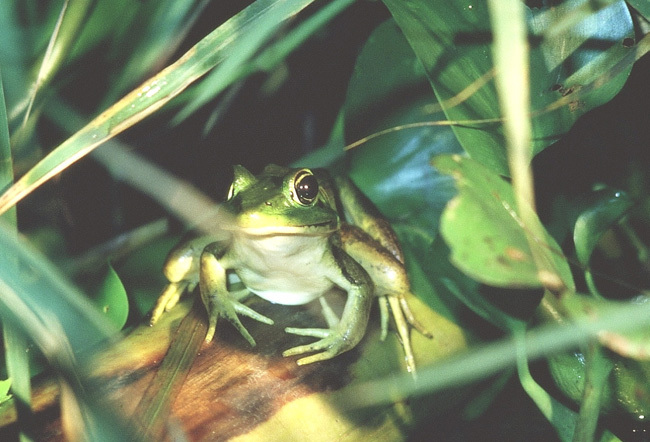 Breeding might actually be a significant reason why treefrogs spend most (or all) their lives on trees: in water puddles on leaves and plants there are no fishes that can prey on eggs and tadpoles. An indication for this is that there are less treefrogs on elevations over 1500 m, where there are no fishes (and the treefrogs that do exist up there, hatch in streams because there are no fishes). Small tree frogs of translucent green colour with round pads on their toes to hold on to leaves. If you put one belly down on a piece of glass you can actually see its internal organs and observe its heartbeat! 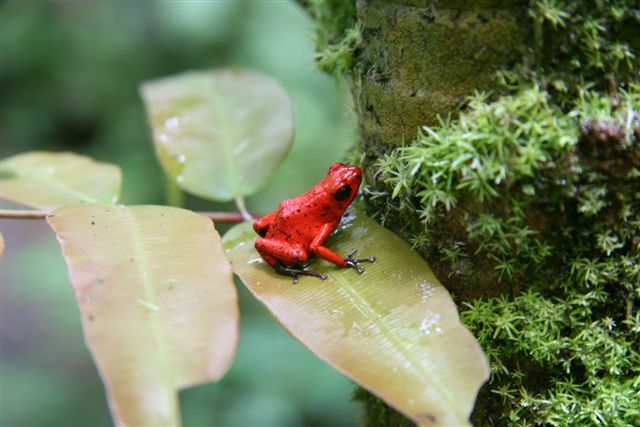 Poison Dart Frogs are tiny frogs in radiant colours in the humid lowlands. Their name stems from poison contained in their skin that native Colombian tribes used for poison on their arrows. They just had to rub the arrows on their backs (sometimes while roasting the frog). When shot into their prey animal of choice, the poison would enter the blood circuit and paralyse it. A likely reason why these frogs produce such strong poisons is that their main diet consists of ants. Hence the frogs take in a lot of formic acids, which is processed into the dart frog’s poison. 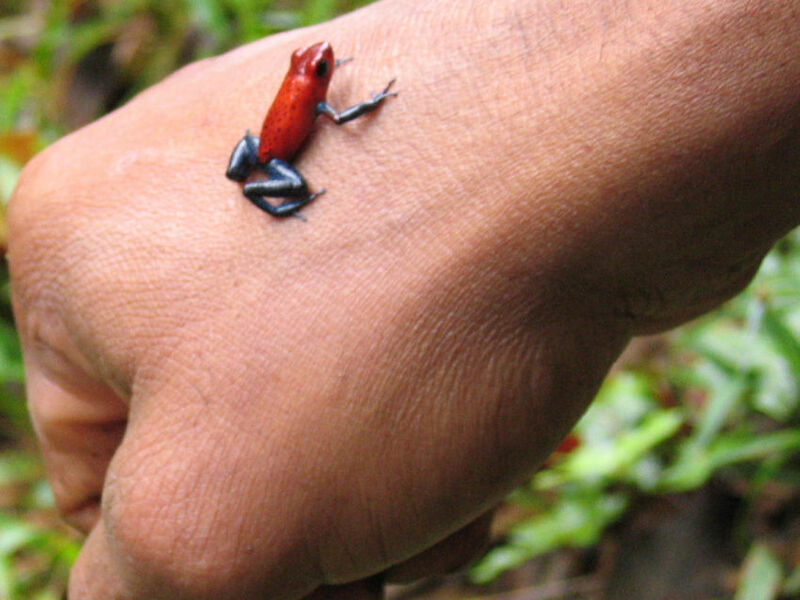 The 7 species of Costa Rican poison dart frogs are poisonous but not lethal for humans. You can even touch them unless you have an open wound: only if the venom makes it into your blood circulation you will be locally paralysed for a while around the place the poison entered. The eggs of most species can survive with little water and are laid on the forest floor. Poison Dart Frogs actually show the most interesting breeding behaviour: after hatching, the tadpoles are carried by the female (or male) adult up to the canopy in a bromeliad containing water. In these protected pools the tadpoles develop into froglets. The female frog even returns to feed them with unfertilised eggs. No other non-mammal (or bird) shows similar parental care to their offspring! 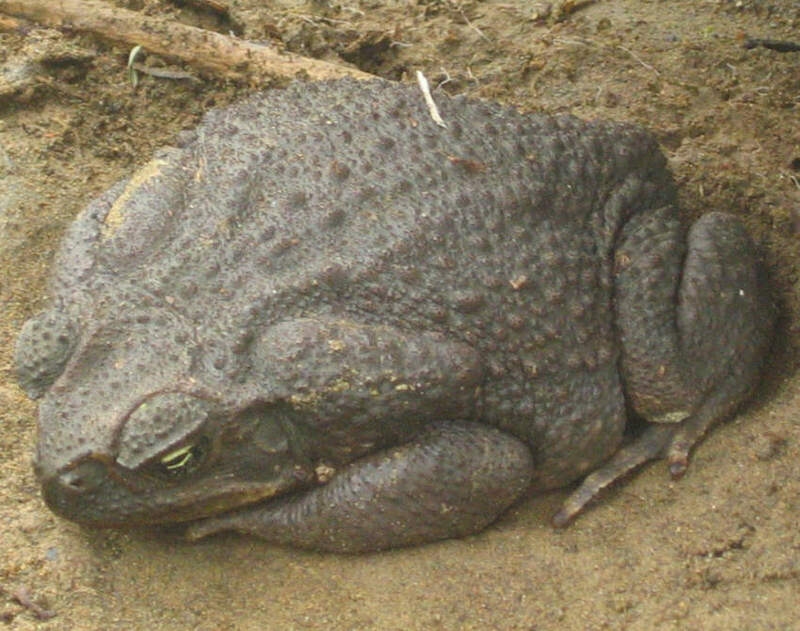 The toad (bufo marinus) is a terrestrial frog subgroup that has thicker and drier skin, enabling it to live on land. The easiest way to recognise a toad is usually by the wart-resembling glands that are spread over their body. Poisonous glands are mostly located on the back on their head, releasing a toxic substance that can kill small mammals the size of dogs. During breeding time, male toads migrate to ponds where their famous calls are heard. After some mating performances the male release a cloud of sperm into the water, into which the female releases between 100 and 20’000 eggs. After a few days the eggs hatch and tadpoles emerge. These again develop into toadlets after around 1-2 months, thereafter leaving the water for an existence on land.